The humanitarian corridor in Eastern Ghouta remains open for those looking to flee the conflict, but the casualties coming through this corridor are substantial and horrific. At least 1500 civilians trying to leave the Damascus suburb of Eastern Ghouta were prevented from doing so by militants, with several people who were trying to leave on Thursday killed or injured. For the first time since Monday, food supplies got into the town of Douma, it follows a pause in Syrian government air strikes overnight, with the situation in the besieged area on Friday described as “calm”. A previous delivery of aid to the region was cut short amid shelling and below are some of the accounts and pictures from the shelling. How the refugee crisis is unfolding in neighbouring countries. Just as I finished writing today’s diary this horrific report came in revealing a chemical attack in eastern Ghouta said to be carried out by Assad forces. If true it’s no wonder President Erdogan called Assad a war criminal. These scenes are truly shocking. Dün gece #Esed rejimi ile müttefikleri #Rusya ve #İran tekrar #DoğuĞuta’nın Hamuriye ve Sakibe bölgelerine kimyasal gaz içeren bombalar attı. Bir çok insan (çoğu kadın ve çocuk) gazdan ağır şekilde etkilendi. Last night #Assad regime and it’s allies #Russia and #Iran bombed the areas of Hamouriyah and Saqeba in #EasternGhouta once again with bombs containing chemical gas. 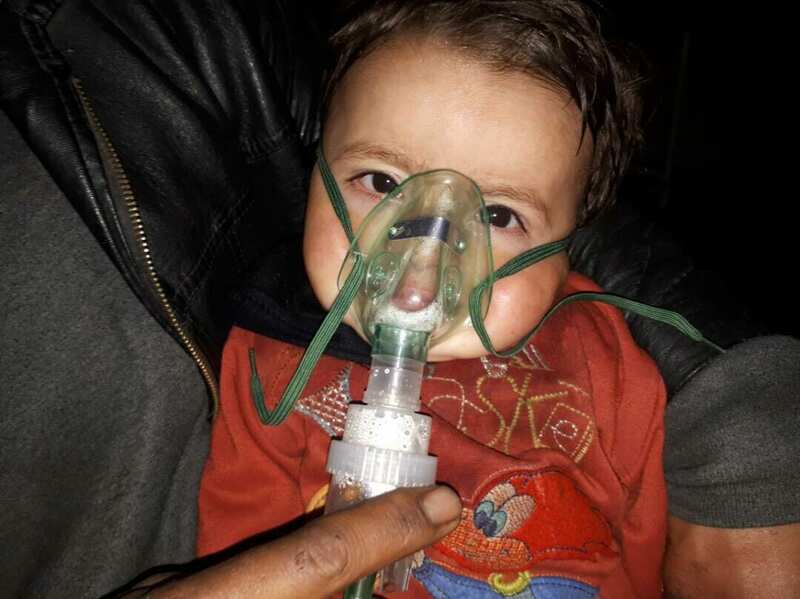 Many people (mostly women and children) were severely affected by the gas attacks. Comment provide by a NGO on the ground OGN. Two children receiving medical treatment in a make shift hospital. The narrative is much worse when you watch the following video. A ceasefire came into effect in Syria’s Eastern Ghouta around 5 days ago in order to allow humanitarian aid deliveries and evacuation of civilians through a specially established humanitarian corridor. However, despite the truce the shelling of Damascus has continued. It is difficult to determine who is breaking the cease fire but ultimately it is effecting those trying to leave the area. UN estimates around 400,000 people remain trapped in besieged Eastern Ghouta since 2013.